Techno meets baroque in cult Norwegian guitarist Stephan Meidell’s second Hubro solo album, an immersive sonic journey incorporating electronic beats, treated tape and synthesiser with a re-edited live ensemble including Hardanger fiddle, baroque violin, prepared piano, harpsichord and clarinet. 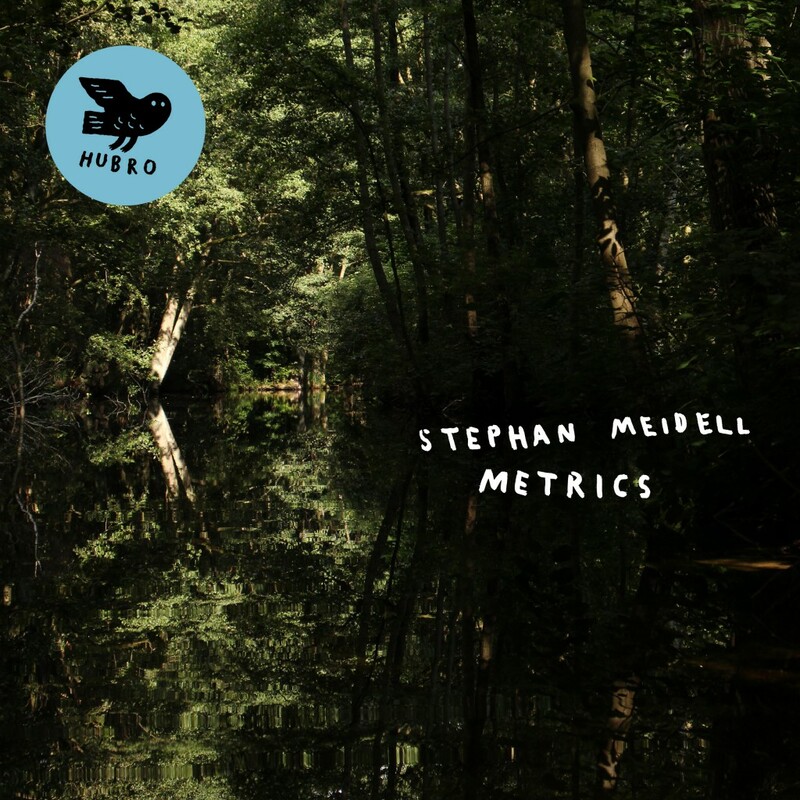 Although the phrase has become almost meaningless through TV talent-show discourse, it’s tempting to describe the experience of listening to Stephan Meidell’s ‘Metrics’ as “a journey”. While there’s no obvious narrative connecting the seven separate pieces that go to make up the album, its restless rhythmic patterning of sound on sound keeps you constantly on the move, travelling from one imagined place or interior space to another, from track to track and beginning to end. ‘Metrics’ also works on several levels simultaneously, so that its secrets are released incrementally, over time. If ever an album demanded to be listened to while lying on the floor in the dark, this is it. What Meidell – whose considerable track record we will come back to – has achieved here is extraordinary, signalling the arrival of a major European voice in a musical area that as yet has no real name. Indeed, you can argue that ‘Metrics’ presents a new form of electro-acoustic art somewhere between sound and music, and between improvisation and composition, that defies all the usual categories, whether post-jazz, post-rock or post-anything. And while Meidell – who’s 34 and on this album has worked between Bergen and Berlin – is, among other things, a guitarist by trade, this doesn’t sound like a guitarist’s album, although there are lots of strings on it. Importantly (and in sharp contrast to his solo debut, ‘Cascades’, also on Hubro), ‘Metrics’ is very much the product of an ensemble, with Meidell picking specific players, helping to guide their improvisations and then editing and shaping the results. The contributions of the various personnel, most of whom have a connection with Meidell through other groups and projects, are vital. By bringing together different musical registers, both through the instruments employed (some of which have very specific cultural associations – like the Hardanger fiddle of Erlend Apneseth, or the harpsichord, or the prepared piano, or the digital sampler), and also through the types of music involved, from techno/electronica to the classical baroque, and from musique concrete to prog-rock to contemporary audio-art, Meidell effectively creates his own palette of sounds, and his own original contexts in which to use them. As a consequence, form and content seem to neatly align, the one echoing the other. There’s also a very winning sense of playfulness to Meidell’s methods, which works against the over-earnest, goatee-stroking, caricature of seriousness sometimes associated with experimental music-makers and listeners. Here, electronic beats might owe their provenance to the manipulation of a mixer without any input, as if some ghost DJ were communicating through the ether, while one’s concentration is continually being refocused by surprising or jarring juxtapositions, as when the drip of what might be synthesised raindrops is heard against what could either be the distressed strings of a baroque violin, or a chair leg being scraped along the floor. As with so much of ‘Metrics’, it’s difficult to tell what’s there and what’s not, or how to separate the audio-real from the audio-hallucination. As ‘Metrics’ did not arrive, as it were, fully formed, it’s useful to check its immediate antecedents in Meidell’s already crowded catalogue of recordings. Last year the debut album of Erlend Apneseth trio, where Stephan´s guitars and electronics play a key role got rave reviews. His previous solo set, ‘Cascades’ (2014), really was a guitarist’s album, with its origins in long, site-specific improvisations in the reverberant spaces of decommissioned factory buildings and silos in Bergen, Norway. The three albums he has made with the trio Cakewalk (2012-17) also contribute to our understanding of ‘Metrics’ through their irreverent approach to the manipulation of sound, crash-editing wildly different genres into new mutant forms. The other key text to consider is probably ‘Hyphen’ (2016) by Strings & Timpani, his duo with the drummer Øyvind Hegg-Lunde. Here, a concern with creating catchy rhythmic ‘cells’ through careful layering and repetition anticipates the fascination with rhythm – and its arhythmic or atonal opposites – we find in ‘Metrics’. But whatever the lineage, whatever the influences, ‘Metrics’ signals a new departure, and a new intensity of approach. It also marks Stephan Meidell as someone to watch very closely from now on. He’s on a journey. The result, ‘Metrics’, is a wholly engaging suite of compositions/improvisations in sound and music that’s quite unlike anything else out there, and as close to an audio-art installation as it is to a conventional album.